The Afghan capital, Kabul, came under attack Tuesday, two days before national elections. The violence included a rocket attack that damaged the presidential palace and a deadly suicide strike. The suicide bombing targeted a coalition military convoy on Jalalabad Road, a major thoroughfare in Kabul. The blast killed seven civilians and wounded 53 others, a defense ministry spokesman told CNN. Two United Nations staff members were among those killed and another was wounded, U.N. special representative in Afghanistan Kai Eide said in a statement. All three were Afghan nationals. NATO International Security Assistance Forces also sustained casualties in the strike, but it is unclear how many or to what extent, ISAF said in a news release. “Afghan and international security force partners are assessing casualties and damage,” the release stated. NATO said the blast was the result of a car bombing. More than 17 Afghan and NATO military vehicles were damaged in the explosion, an ISAF spokeswoman said. Hours earlier, one person was injured when militants fired two rockets at the Gul Khana Palace compound, a palace official said. One of the rockets struck the compound, which houses the office of President Hamid Karzai, the official said. Karzai was inside the compound at the time of the strike, but was in a different building and was not injured. There were other attacks outside Kabul that targeted NATO and Afghan forces on Tuesday. A roadside bombing struck a NATO convoy in Paktika province in eastern Afghanistan, killing two U.S. service members, according to NATO and a U.S. military spokeswoman. Also on Tuesday, a suicide bomber attacked an Afghan army checkpoint in the central province of Oruzgan, killing four Afghan soldiers, a defense ministry spokesman told CNN. Two civilians were also killed, the provincial police chief said. A candidate running for the local council in the northern Jawzjan province was shot and killed late Monday, local officials said. Two gunmen pulled Mullah Abdul Rahim out of his vehicle and shot him, the district governor told CNN. There have been no arrests and no one has claimed responsibility for the killing. The attacks come as Afghan and U.S. military forces have stepped up security across the country for Thursday’s presidential and provincial council elections. On Saturday, a suicide bombing killed seven people and injured 91 in Kabul. The bombing occurred near the main gate of NATO’s International Security Assistance Force, wounding several coalition troops. The Taliban claimed responsibility for that attack, which heightened security concerns about the election. The Taliban has vowed to disrupt the voting. 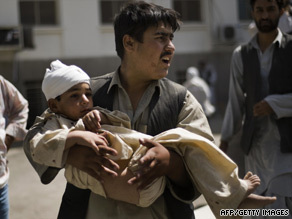 This summer has been the bloodiest in Afghanistan since 2001, particularly in Helmand province in the south. U.S., British and Afghan troops have been involved in fierce clashes with the Taliban there. Kabul, however, had experienced relative calm in recent months before the latest attacks.